Named for its 17th- to early 20th-century owners, the Salvin Hours is one of the largest and most richly decorated English books of hours. Its decoration, created by two artists, resembles contemporary wall paintings in the Oxford area, suggesting that it was made in a workshop there. Its original owner probably was a high-status person living in Lincoln because it also resembles 13th-century books of hours associated with that city. It lacks a calendar, which would have helped to locate its original place of use because it would have listed saints' feasts special to a particular place. The Hours of the Virgin was borrowed from the prayerbook used by monks to become the core of the Book of Hours. Vespers, the evening hour, was one of the most popular of the hours, its celebration becoming more like a church service. 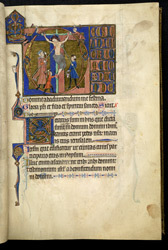 Here the accompanying image depicts the Crucifixion, one of the scenes from the Passion of Christ. The evil caricatures who inhabit the Salvin Hours as the tormentors of Christ enact the stages of the story simultaneously. The idea is to create an aid to the devotions of the reader, which would involve his or her identification with the sufferings of Christ. The Longinus, who spears the side of Christ, is shown being blinded by the blood, a traditional detail.